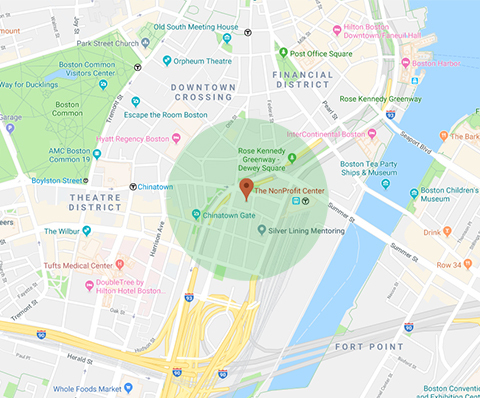 We're one block from South Station, a major public transportation hub and close to the intersection of interstate highways I-90 and I-93. The center is accessible through the main lobby to people who have restricted physical abilities. Exit the train at South Station. Follow signs for "commuter rail & bus terminal." When in the main concourse, continue to the far doors (past the food court) and the train platforms. When you reach the start of the platforms, take a right. Exit down the stairs to Atlantic Ave.
Cross at the light onto Essex St., and walk one block. The One Financial tower will be on your right. The NonProfit Center is on the corner of Essex and South streets. The entrance is on South Street through the revolving glass doors. Exit the train at Chinatown station. At street level, head to the Dunkin' Donuts on the corner (near the RMV exit). With the Dunkin' Donuts on your right, walk down Essex Street for seven (short) blocks, crossing Surface Artery Road. Exit the train at Boylston station. At street level, cross Tremont Street and walk to the lights. This intersection is Boylston and Tremont. Turn left onto Boylston. Boylston will turn into Essex Street at Washington Street. Continue on Essex Street for seven (short) blocks, crossing Surface Artery Road. From Points South: Take Interstate 93 North to Exit 20. Bear right onto off-ramp at Exit 20 to Frontage Rd (Frontage Road Northbound, New Frontage Road North). Follow signs for South Station, exiting onto Atlantic Avenue. At your second light, turn left onto Essex Street. Turn left onto South Street. The NonProfit Center is at 89 South Street, on your right. From Points North: Take I-93 South toward Boston. Take the Purchase Street, Exit #23 toward South Station. Continue on Purchase Street. Continue on Surface Road. Take a left onto Essex Street. Take a right onto South Street. The NonProfit Center is at 89 South Street. From Points West: Take I-90 (Mass Pike) east towards Boston to the Mass Pike Extension. Bear left onto off-ramp at Exit 24 A-B-C, and take Exit 24A to South Station. Drive off the ramp onto Atlantic Avenue. At the second light, turn left onto Essex Street. Take your first left onto South Street. The NonProfit Center is at 89 South Street, on your right.